1. Measure Results from New Patient Marketing. Use the chart below to make a list of every marketing tactic in which you are currently investing to drive new patient traffic. Start by writing down the average annual value of a new patient. This will not change from tactic to tactic, but you will need it for each tactic’s return on investment calculation. 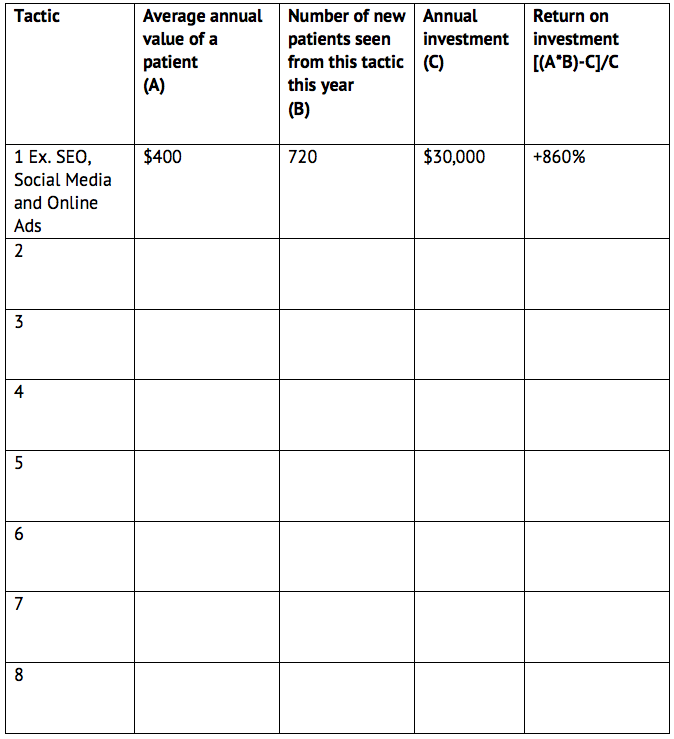 Next, for each tactic, write down how much you are investing annually. To calculate the return on investment on each tactic, first multiply the average annual value of a new patient (A) by the number of new patients seen from this tactic this year (B). Then, subtract the annual investment (C). Finally, divide that figure by the annual investment (C) and multiply it by 100 to get the percentage of return. Finally, write that figure in the third space for each tactic. In the example, the dentist invested $30,000 to attract $288,000 in production. The return on investment was positive 860%. It is clear that this marketing tactic is working. With this chart complete, you can clearly see what is driving a return on investment and what is not, and what marketing is working and what is not. If, in analyzing this tool, you see any direct marketing efforts – those meant to drive new patient traffic and production dollars – that are not producing a return on investment, you might consider recalibrating or nixing them. In some cases, you invest in marketing that will never convert to a measurable return. A logo or sign create awareness but do not translate into production dollars. That’s not to say they are not worthwhile investments. In our example above, where the average annual value of a new patient is $400, that variance in patients can mean the difference between $1 million and $1.4 million in production. Let’s make sure that’s not happening to you. Gather reports detailing all existing patients 6 months ago, 12 months ago, 18 months ago and 24 months ago. Of the 12-months-ago batch, what percentage returned for their recall appointment as shown in the 6-months-ago batch? Keep going back, asking the same question for the next two time periods. If your percentages are creeping upwards of 20% and beyond, it’s time to implement a robust internal marketing program. This can include staff training to deliver excellent service, referral marketing programs, recall systems such as DemandForce or Lighthouse 360 and other initiatives to keep patients happy, returning and raving about the practice. 3. Explore Alternatives. Just because production and patient numbers are up doesn’t mean marketing can’t be improved. Always be looking for the best way to serve patients, the most effective way to attract your ideal patients and the easiest way to make it happen while you focus on dentistry.